Maldon is a rural town 120 km north-west of Melbourne and 25 km beyond Castlemaine. It is a former gold town, situated away from major arterial roads and railways. It was declared Australia’s first notable town in 1966 by the National Trust, and an interim development order was placed on Maldon in 1970 to prevent the demolition of buildings. Maldon is situated on the former Cairn Curran pastoral run (1840), which was owned by the Simson family who also had the Tarrangower run immediately to the south. Mount Tarrangower overlooks Maldon from the west, and it was near the foot of the mount that gold was found by a Pole, John Mechosk, in December 1853. A rush occurred in 1854 and a township was surveyed. It is thought that the name Maldon was proposed by a member of the survey party, perhaps inspired by the hilly country resembling Maldon in Essex, England. A municipality was created in 1858, in turn becoming a district (1863) and a shire on 12 January 1864. A brewery and several hotels were built in 1854 and a Wesleyan church was opened in 1855. 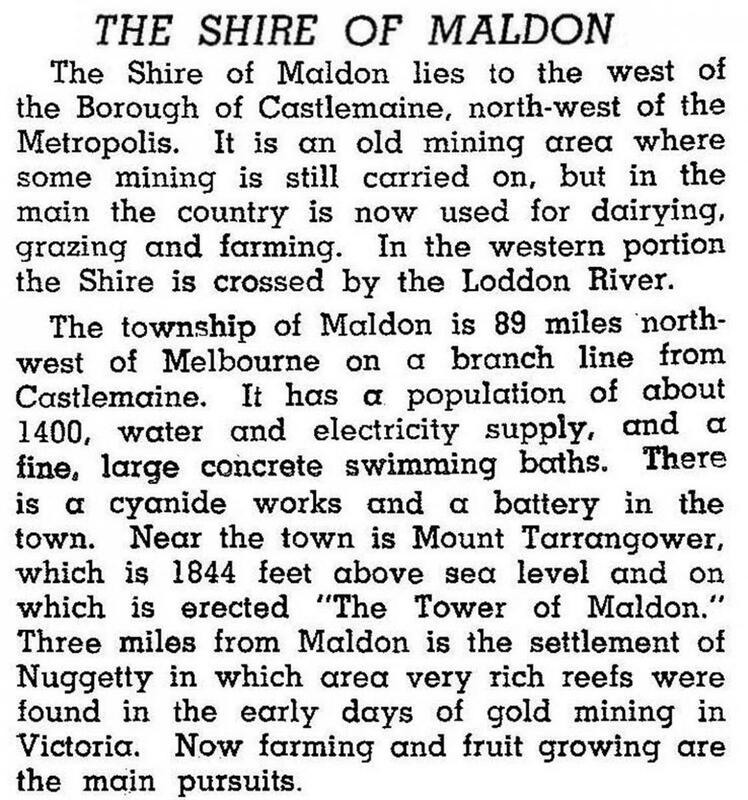 A particularly rich gold field was found in 1855 in the hills north of Maldon. Named Nuggetty, it was a source of easily won wealth, and the Mines Department calculated that over 300,000 ounces of gold were taken. Another notable area, immediately east of Maldon’s commercial centre, was the Beehive Company. It is marked by the remains of a chimney stack (1863). 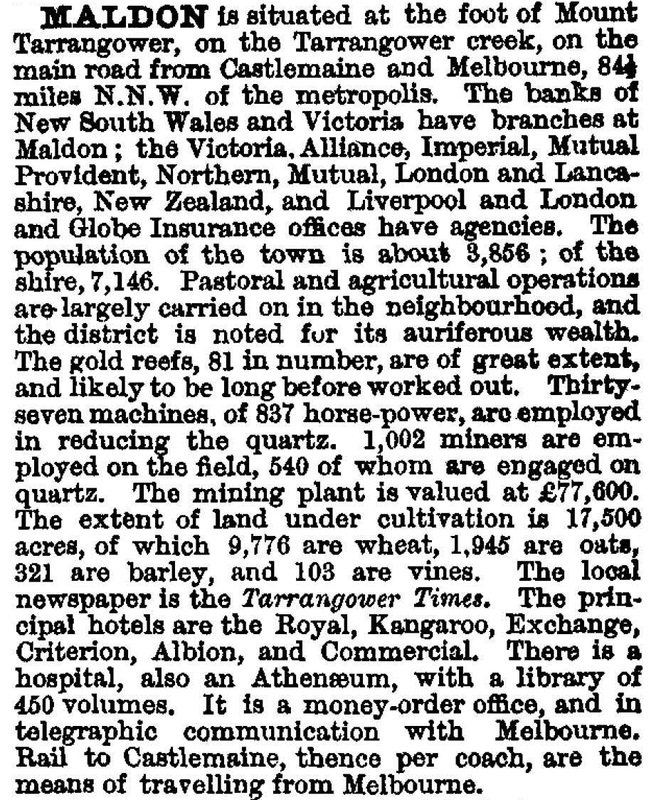 In 1865 Bailliere’s Victorian gazetteer recorded Maldon as having the Tarrangower times newspaper (1858), numerous hotels and banks, two schools, a hospital (1859) and an athenaeum. In addition there were Anglican (1861), Welsh Baptist (1865), Welsh Congregational (1863) and Methodist (1863) churches, and an unusual market hall (1859) which became the shire offices and much later a museum. Maldon was connected by railway to Castlemaine in 1884, and an extension to Shelbourne, about 15 km northwards, was made in 1891. Neither line was a main one. By 1921, however, Maldon had fallen back to below its 1891 population. The last substantial gold mining operation closed in 1926. The town’s population stabilised at around 1000 people, dependent on surrounding pastoral activity. A footwear factory was started in 1944, and the Cairn Curran reservoir, about 10 km west of Maldon, was begun in 1947. Work was completed ten years later. 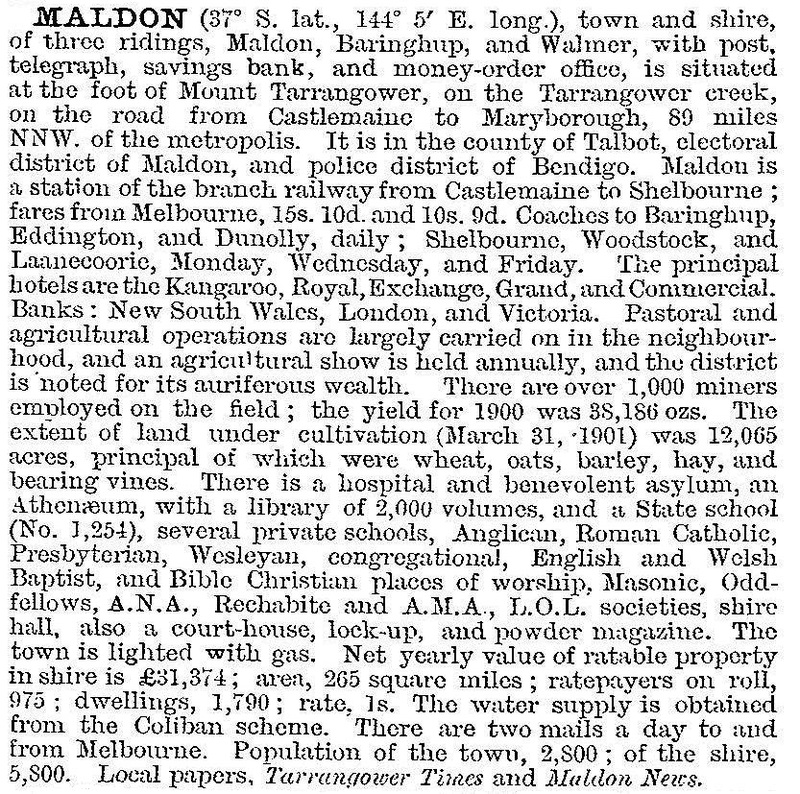 In another ten years the National Trust declared Maldon as ‘The First Notable Town in Australia’. That citation began a minor property boom as Melburnites began buying old houses as weekenders. The effect on streetscapes and on house renters was detrimental, and controls were placed on building alterations. A State-funded heritage-advisory service and restoration fund have assisted with preservation works. In 1973 an annual folk festival was started, and an annual Easter festival is conducted. Several shops along Main Street have been converted to eateries and tourist-oriented retailing. Historic walks are well documented, and the museum (former shire offices) is open on afternoons to provide information. Mount Tarrangower has a lookout for a view of the town, and the former hill-climb rally track to the summit is well made. Notable public buildings include the Anglican church (1861), the hospital (1860), the former court house (1861), the school (1875) and the post office (1869). The former Denominational School (1856 and 1862) is also an interesting building. The National Estate’s Maldon conservation area includes much of the town and some adjoining mine area. An historic reserve of about 2500 ha protects many relic mining areas and includes Nuggetty, the Tarrangower area and a third area south-east of the town. Some patches, especially escarpments, are infested with wheel cactus (Opuntia Robusta). Maldon has attractive tree plantings, and numerous refurbished cottages have well-tended gardens. There is a tourist railway from the heritage-listed Maldon station (1884) to Castlemaine on weekends, school holidays and public holidays. There are three hotels, numerous bed-and-breakfasts, a caravan park, cafes and restaurants, a golf course and a showground. The Tarrangower minimum security women's prison (1988) is at Nuggetty. The railway station was destroyed by fire in 2009, but rebuilt. The primary school had 103 pupils in 2014. Several notable persons have Maldon associations. Among those born there were Bill Maldon Woodfull (1897-1965), test cricketer and high school principal, and Stephen Roberts (1901-1971), historian and vice-chancellor. Ethel Florence Richardson (1870-1946) lived in Maldon when her mother was postmistress, and the town is a gathering place for the Henry Handel Richardson Society. Its sole railway line form Castlemaine to Shelbourne closed in 1969 (Shelbourne-Maldon) and 1976 (Maldon-Castlemaine). Maldon township was the dominant urban centre, and Muckleford and Baringhup were little more than villages. In 1994 50% of Maldon shire was farmland, carrying 72,000 sheep and lambs and 2200 cattle and producing 2200 tonnes of wheat. In 1995 most of Maldon shire was united with Castlemaine city, Newstead shire and most of Metcalfe shire to form Mount Alexander shire.